Kremlin views military intervention as a response to direct threat to Russians and Black Sea fleet. Russia’s Federation Council on Saturday unanimously authorized President Vladimir Putin to send armed forces into Ukraine. The resolution of the upper house of parliament took effect immediately, according to Federation Council chair Valentina Matviyenko. 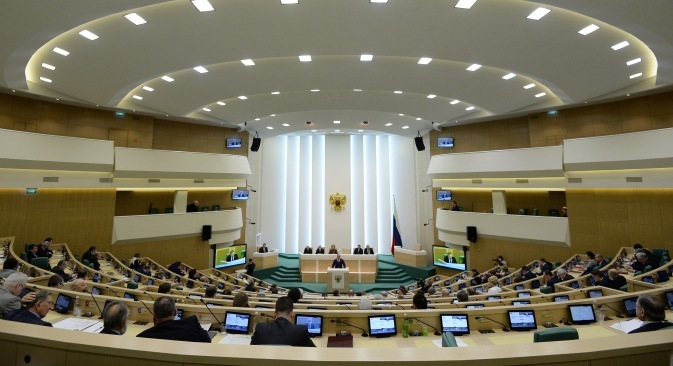 All 90 senators of the 116-member Federation Council who were present voted to support the resolution. Putin said that he made the request to send troops in response to a direct threat to the lives of Russians living in Ukraine as well as military forces in Ukraine’s southern peninsula of Crimea. Putin's spokesman said on Saturday that the president had not yet reacted to a proposal in the Federation Council that he recall the ambassador from Washington. "There is no decision about it yet," Dmitry Peskov told Interfax. Russian officials said that the country reacted within the framework of an agreement with Ukraine that allows the stationing of Russia’s Black Sea Fleet in Crimea. Russia’s ambassador to the United Nations Vitaly Churkin said, "We have an agreement with Ukraine on the presence of the Black Sea Fleet in Sevastopol and we act within the framework of that agreement." He spoke following a UN Security Council session devoted to the situation in Ukraine. Russia leases berths in the port of Sevastopol to moor over 30 warships. The city also houses the headquarters of the Russian Black Sea Fleet, a central communications hub, a naval hospital, an air defense missile regiment, a marine regiment, an arsenal, and a yacht club. There are some 14,000 Russian servicemen stationed in Crimea. Earlier on Friday, Feb. 28, US President Barack Obama said that Russian military intervention in Ukraine was unacceptable. White House officials said it could threaten the G8 summit that Russia is hosting in Sochi this June. Churkin added that Russia was against any international mediation mission to Crimea. "The Crimean authorities should be asked what they think about such a mission,” he said. “But we are against imposed mediation." He said that Russia’s primary interest is stability in Ukraine. Churkin added that the current crisis was triggered by the failure to honor a political agreement signed in Kiev by the opposition and Ukraine President Viktor Yanukovych. He said the agreement was discarded “by the new forces that have come to power in Ukraine. He went on to say that the current authorities in Ukraine, who were elected under pressure from street protestors, "cannot be described as a government of national unity." "It has caused some bitter reaction in some parts of Ukraine, including Crimea," Churkin explained. He added that the best way out of the crisis was "to return to the agreement and proceed along the steps envisaged there." Asked whether Russia would be joining in an international mediation mission in Ukraine, Churkin said that it was "an idea that should be analyzed". Earlier on Friday, statements were made in the Ukrainian parliament denouncing the existing agreements between Ukraine and the Russian Federation on the presence of the Russian Black Sea Fleet on Ukrainian territory. These agreements were signed on Apr. 21, 2010 by the then presidents of Russia and Ukraine in Kharkiv, and are therefore known as Kharkiv agreements. Viktor Yanukovych and the then Russian president, Dmitry Medvedev, agreed that the existing agreement between Ukraine and Russia on the status and terms for the presence of the Russian Black Sea Fleet in Ukraine would be extended from May 28, 2017 for 25 more years, together with the agreement on dividing Black Sea Fleet armaments and bases between the two countries.